CatechismClass.com is Faithful to the Church — We Guarantee It! 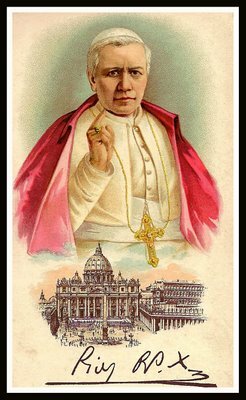 On September 1, 1910, His Holiness Pope St. Pius X issued the Oath Against Modernism in his motu proprio "Sacrorum Antistitum." In keeping with the solemn teachings of the Church and those traditions revered by our forefathers and upheld by our Bishops, priests, and Holy Father, all employees of CatechismClass.com are required to swear to the following Oath and live lives in accord with the teachings of the Church. You can be certain that our course materials and paperback books are fully faithful to the Catholic Faith! I _____________________________firmly embrace and accept each and every definition that has been set forth and declared by the unerring teaching authority of the Church, especially those principal truths which are directly opposed to the errors of this day. And first of all, I profess that God, the origin and end of all things, can be known with certainty by the natural light of reason from the created world (see Rom. 1:90), that is, from the visible works of creation, as a cause from its effects, and that, therefore, his existence can also be demonstrated: Secondly, I accept and acknowledge the external proofs of revelation, that is, divine acts and especially miracles and prophecies as the surest signs of the divine origin of the Christian religion and I hold that these same proofs are well adapted to the understanding of all eras and all men, even of this time. Thirdly, I believe with equally firm faith that the Church, the guardian and teacher of the revealed word, was personally instituted by the real and historical Christ when he lived among us, and that the Church was built upon Peter, the prince of the apostolic hierarchy, and his successors for the duration of time. Fourthly, I sincerely hold that the doctrine of faith was handed down to us from the apostles through the orthodox Fathers in exactly the same meaning and always in the same purport. Therefore, I entirely reject the heretical' misrepresentation that dogmas evolve and change from one meaning to another different from the one which the Church held previously. I also condemn every error according to which, in place of the divine deposit which has been given to the spouse of Christ to be carefully guarded by her, there is put a philosophical figment or product of a human conscience that has gradually been developed by human effort and will continue to develop indefinitely. Fifthly, I hold with certainty and sincerely confess that faith is not a blind sentiment of religion welling up from the depths of the subconscious under the impulse of the heart and the motion of a will trained to morality; but faith is a genuine assent of the intellect to truth received by hearing from an external source. By this assent, because of the authority of the supremely truthful God, we believe to be true that which has been revealed and attested to by a personal God, our creator and lord. Click here to explore our many programs — all guaranteed to be in accordance with the Faith as taught and preserved by the Holy Catholic Church.